It was a show stopping weekend with AURA-listed events held across the eastern seaboard as we saw the Coburg 24hour (National Championship), Canberra 50k (National Championship), and the Great Ocean Run take place, with witnesses seeing what legends are truly made of. Taking first for the men was Kevin Muller from Wodonga, Vic who succeeded with 629 laps of the course to lay claim of 251.605kms. It was reported on the socials that his finish time was 8th or 9th best in Australian records and is yet to be ratified/confirmed. Kensington’s (Vic) John Yoon wasn’t far behind with his second placing of 548 laps and 219.245kms, while Daragh O’Loughlin from St Kilda, Vic held on to take third with 521 laps and 208.705kms. In the women’s event Victorian Nicole Vaughan claimed top podium finish with 479 laps and 191.628kms but it was AURA member Cheryl Symons from Murrumbeena, Vic who took control of her own race, finishing the day with 465 laps and 186.311kms as she took first place for the National Championships title. Kensington local Karen Mickle held on to second for the women’s National Championships placings after finishing 436 laps with 174.642kms under her belt while Kris Ryan secured third (168.177kms). Congratulations to all AURA members who completed the 24hour event including Ben Hirst (170.000kms), Sher Mayne Chan (155.645kms), George Alexanderopolous (155.197kms), Myra Keep (151.621kms), Duc Do (142.418kms), Bernadette Benson (126.800kms), Frank Palermo (122.231kms), Stephen Lewis (120.000kms), Malcolm Gamble (98.000kms), Thomas Billett (86.400kms), Shane James (75.384kms) and Tony Wilms (22.800kms). 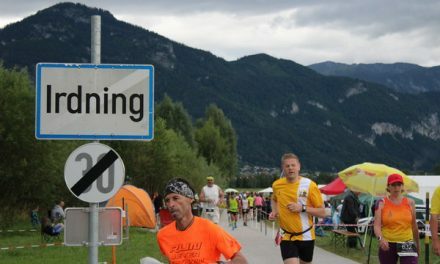 Canadian record set: During her time racing in the 24hour event at Coburg, Benson set three new records for the Canadian W50 division – 67.531kms for 6 hours, a time of 9:12:31 for 100kms, and a distance of 126.146kms for 12 hours. A big congratulations to Benson on these three records, no doubt set by dedicated training and discipline. On to the 12hour event at Coburg and household name Tia Jones from Ipswich, Qld dominated the women’s track having completed 283 laps and 117.546kms. Annabel Hepworth from Annandale, NSW claimed a worthy second place on the podium after 215 laps and 89.179kms. Well-known Heathcote local Stephen Redfern controlled his race to take first place for the men, despite having only entered the race last minute – three days out. Gaining an extra 6.5kms on his total over Canberra 12hour Track Race five weeks earlier, Redfern finished 317 laps with a distance of 131.585kms. High fives for amazing efforts also to Regan Doyle (92.537kms) and Bill Bardsley (71.329kms). Looking at the 6hour race for the men Wights Mountain’s (Qld) Matthew Eckford took a steady second with 76.025kms whilst Jevvan McPhee from Mernda, Vic claimed a third podium finish thanks to a finish of 51.557kms. For the women, Tash Fraser from Ballarat, Vic (who also features in AURA’s Coach’s Corner segment in our monthly Ultramag publication) secured a first place finish with 72.127kms and Donna Urquhart from Black Rock, Vic took control of second place with 65.484kms. Congratulations also to Nikki Wynd (60.504kms) and Annabel Hepworth (28.614kms). 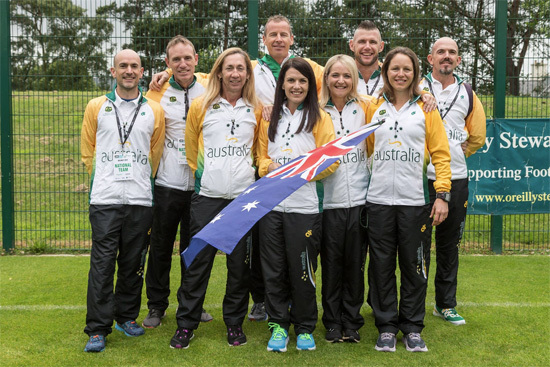 Stellar efforts also were seen by Sharon Scholz who took first female in the 24hour Walk (163.983kms) and husband Justin Scholz who claimed first male in the 12hour Walk (58.322kms). Sandra Howorth completed 36.420kms in the 6hour Walk (third female) and Ernie Hartley finished 34.832kms in the 6hour Walk (third male) whilst John Timms held on to 32.787kms. With shorter events like the 5kms and 10kms held on Saturday, the Canberra Running Festival’s 50k race, which also doubled as an AURA National Championship, took place on Sunday, and it was Ash Watson from Nerrina, Vic who took out first overall and first male in the ultra marathon with a speedy time of 2:59:40. 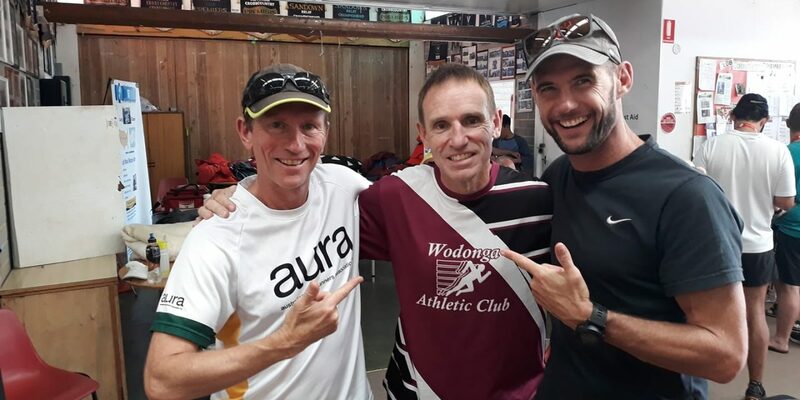 Woodford’s (NSW) Brendan Davies (also featuring in Ultramag’s Coach’s Corner advice segment) proudly took second male in AURA’s championship podium with 3:08:28 while Barry Keem took third in the NC title after finishing his 50kms in 3:10:17. For the women, Zoe Hawkins took the crown for the ladies with her time of 3:55:23 but it was Corrina Black from Mermaid Beach, Qld who claimed the title in the National Championships with 4:03:16. She was closely followed by Alena Scurrah who took second (4:14:48) and Katherine Booy who held on to third (4:31:04). Congratulations also goes to AURA members who successfully finished the 50kms in Canberra including Andrew Heyden (3:17:31), Michael Wakefield (3:18:37), Philip Balnave (3:31:43), David Von Senden (3:53:07), Carmen Atkinson (4:35:49), Pam Muston (4:43:25), Gemma Worland (4:45:08), Karen Woon Cheung Chan (6:02:00) and Mick Jeffrey (6:16:33). Run along the oceanfront to Coffs Harbour jetty in NSW the Bailey Centre Great Ocean 45kms Run allowed participants to traverse five creek crossings and 10 headlands. One of Australia’s most picturesque courses, runners took to all types of terrain including beaches and creek crossings. First female came in as Clare Palmer from Glenreagh, NSW who completed the distance in 3:46:18 and congratulations also to Jodie Oborne (4:42:35). 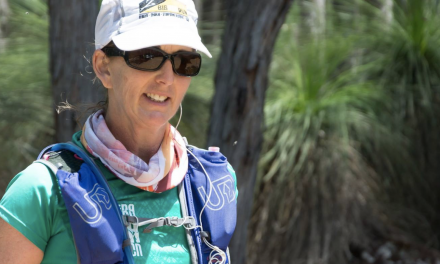 Record set: Crossing overseas, dual Australian/US citizen and AURA member living in the USA Marie Boyd rain in the Sisyphus Ultra at the weekend, and according to our records has set the W70-74 age group record in both countries for 48hours with 107 miles. A massive congratulations to Boyd on this achievement. The next races on the AURA calendar are Lighthorse Ultra in WA on Saturday, April 27 and Convicts & Wenches in Tas on Sunday, April 28. AURA would like to wish everyone a very happy and safe Easter long weekend! Pictured: A photo of three of the last four men to break 250kms for Australia. From left to right is Martin Fryer, Kevin Muller and Matthew Eckford. Photograph – Martin Fryer/Facebook.